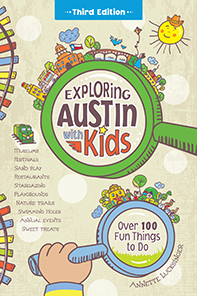 Visitors will enjoy this open-air tour of the city in an amphibious vehicle that travels from downtown into Lake Austin. Locals will likely learn some new nuggets of information as well. For instance, did you know that Deep Eddy is the oldest public pool in the state of Texas, and that City Hall was built in the shape of an armadillo? The tour covers historic downtown buildings, the Capitol and Governor’s Mansion, then heads west down 6th St. to Lake Austin Blvd. Children are kept busy quacking with souvenir duckbills and waving to passersby while anticipating the big splash into Lake Austin where they get an up-close view of the Tom Miller dam. The entire tour lasts approximately 1 hour and 15 minutes. Drinks are allowed on board and restrooms are available at the Austin Visitor Center, the pick-up and drop-off point for the duck boat. Reservations are recommended. Tours begin from the Austin Visitor Center located at 209 E. 6th St.
Curbside meter parking is available downtown, as well as several parking lots and garages. See www.downtownaustin.com/transportation/parking. To ensure your reservation, arrive 15-30 minutes early. Online reservations are preferred. Tickets are also sold in the Visitor Center or over the phone. Prices do not include tax.